Yellowstone National Park is riddled with constantly changing geothermal hot spots—it's part of the reason for the park's famous geysers. 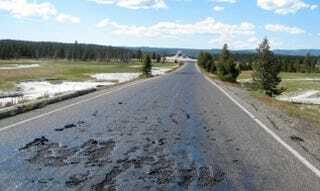 But this past Thursday, the area around one section of road got so hot that asphalt literally started melting. The soupy mess of a road forced park officials to close off access to some of the park's biggest tourist attractions. What's more, visitors have been warned against even attempting to hike in the area—the spiking temperatures have created hidden pockets of boiling hot water.